The growing trend of drinking and selling raw milk is getting one of its first major legal battles, with an Amish farmer possibly facing jail time for violating Wisconsin's dairy and food licensing laws by selling unpasteurized milk. Vernon Hershberger, 41, is an Amish dairy farmer living in Loganville, Wisconsin, who has been selling raw milk to his 150-member food club. The food club was a tight-knit community – members had become so enchanted with the farming routine that they would volunteer their services, helping to care for the cows and package food. No big deal, right? In fact, Hershberger has been charged with four criminal misdemeanor counts in connection with alleged violations dating back to 2010. And while it seems like the travails of an Amish farmer might have limited repercussions for the general public, the opposite is true: this trial could create wide-ranging policy around what individuals can buy and sell to their communities. Hershberger has argued that there are no permits available that would allow him to sell raw milk, since the state bans such sales except on an “incidental” basis. He has maintained he has a right to sell food on a private contractual basis to his food club. This is not passive resistance by Hershberger, either: he allegedly violated a state holding order in June 2010, when he cut the tape regulators had placed on his farm store refrigerators so as to continue supplying his food club members. 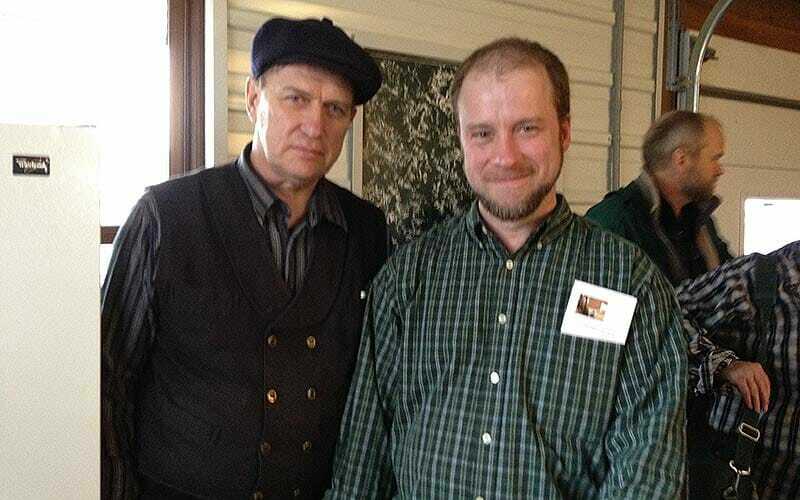 Vernon Hershberger (right) and a supporter in Loganville, WI. The jury’s verdict in the trial could go a long way toward determining the future of the fast-expanding private food movement in the U.S. The trial, scheduled to begin Monday in the small town of Baraboo, WI, has become a flashpoint for the burgeoning “food sovereignty” movement. Hershberger’s supporters are expected to fill the small-town courthouse, and rumor has it some famous faces will be in the courtroom, including Virginia celebrity farmer Joel Salatin, California raw dairy owner Mark McAfee, and Canadian food rights advocate Michael Schmidt. 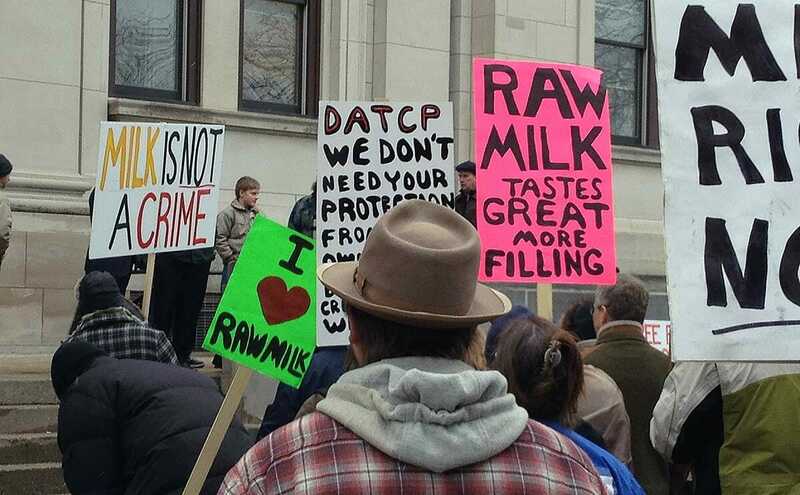 Is buying raw milk (or any unsanctioned food) an American right? Americans have always been able to obtain food privately – whether directly from farm stores or at church suppers or via lemonade stands or from neighbors selling extra milk or cans of food. It’s just that the “right” wasn’t called a right, because it was a custom or a tradition, a part of the fabric of life in communities large and small. The tradition has continued via farmers markets and CSAs. Private markets sprung up even for prepared food – for example, San Francisco’s Underground Market, with vendors selling food ranging from foraged seaweed to Belgian waffles. Elected and appointed officials didn’t even think to question it because they were getting food that way as well. But in recent years, government at all levels has begun challenging the custom more aggressively; for example, San Francisco public health officials shut down the Underground Market in 2011, after it was deemed to have gotten out of hand because it had grown so large. Still, a growing number of people have been seeking food directly from farms, This makes the long-ignored custom feel more like a necessary right. Who counts as the “public,” anyways? Do I need a permit to serve raw milk pudding in my own home to friends? What are the actual current laws about what farmers can sell? Part of the legal challenge is that there isn’t a lot of legal precedent covering private food sales by farmers. Farmers just did it, and no one questioned it – it was how many people obtained their food before the advent of supermarkets. But the growing concerns many people have about pesticides, hormones, and antibiotic residues in their foods have driven more consumers to seek out food raised the old-fashioned way from farmers like Vernon Hershberger. Regulators, more sensitive than ever to problems from food tainted by pathogens, have raised objections to the private unregulated sales. Lately, though, judges have been mostly buying into the regulator-prosecutor argument that there is no right to privately obtain forbidden foods. Take, for instance, Wisconsin Judge Patrick Fiedler’s now-infamous 2011 statement that farmers have “no… fundamental right to consume the milk from their own cow.” Now another Wisconsin judge, Guy Reynolds, is hearing the arguments in the Hershberger case, and being forced to think about hard issues here. But unlike those other cases, Judge Reynolds must defer to a jury, which will render the final verdict. Will this trial set blueprint for what farmers can sell privately? This is one of a cluster of similar cases around the country occurring at both the federal and local level. There was a loss when an Amish farmer in Pennsylvania last year decided to quit farming rather than fight a federal injunction prohibiting him from shipping raw milk to food club members in Maryland. But last September, a jury acquitted a Minnesota farmer, Alvin Schlangen, who was accused of similar violations as Hershberger. In quickly deciding in favor of the farmer, the jurors rejected the government arguments nearly as definitively as Judge Fiedler rejected the farmers’ arguments. But then in late April, a Maine judge ruled against farmer Dan Brown, essentially nullifying a “food sovereignty” ordinance his town, Blue Hill, had passed two years earlier, allowing farmers to sell food directly to consumers without regulatory interference. With the legal landscape uneven thus far, the Hershberger case clearly takes on added importance. The Wisconsin prosecutors are understandably terrified to be going before a jury of ordinary people, who understandably will wonder why the state is expending so much effort against a single farmer committing the crime of making healthy food available to a small community of eager eaters. While the trial next week will focus heavily on legal technicalities associated with permits and licenses, it is important for farmers to not lose sight of the forest for all the crazy and difficult-to-comprehend stuff happening in the trees.